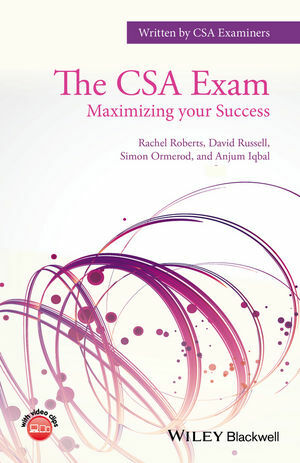 Written by a team of practising GPs and CSA examiners, in collaboration with the recent CSA Role-Player Lead responsible for training and quality-assuring the work of the simulated patients in the exam, The CSA Exam: Maximizing your Success is a key resource for trainees and their trainers, in preparing for this component of the MRCGP assessment. Designed to help readers prepare and master the knowledge, skills, and attitudes needed to pass, it focuses on what is truly expected by examiners and demystifies all aspects of the exam. Taking an approach to preparation which looks at the candidate, simulated patients and the assessment itself, The CSA Exam: Maximizing your Success provides MRCGP candidates and GP trainers with an invaluable and unique resource for success in the exam. Rachel Roberts is a GP, trainer, CSA Examiner, and is a Patch Associate Director for General Practice, London. She is also the Associate director for trainees in difficulty for North East and Central London. David Russell is as a retired teacher and has a strong educational and examining background. Appointed Lay Adviser to the RCGP, he worked on the Simulated Surgery Exams, and subsequently on the development of the CSA exam. He has been the CSA Role-Player Lead, responsible for the training and quality assurance of the simulated patients, and has published several papers about his work with the simulated ‘patients’ in the CSA. Simon Ormerod is a GP with a special interest in General Practice. He has been a trainer since 1996, and a member of the MRCGP examiners panel since 2010. He is currently Honorary Secretary of the North East London Faculty RCGP. Anjum Iqbal qualified from the Royal Free Hospital and worked as a GP for five years in Stepney, East London. In 1996, he moved GP practice to Enfield, North London. He remains committed to Education and Training as a Trainer and Programme Director in Enfield. He has also been a CSA examiner since 2008.